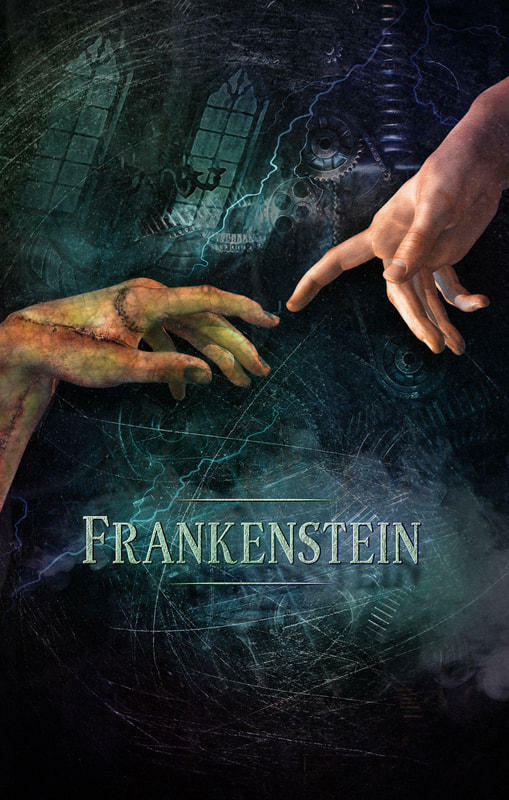 Springfield Contemporary Theatre Presents a More Authentic Take on "Frankenstein"
Dr. Frankenstein--actor/director Nathan Shelton, and The Creature--actor Heath Hillhouse. Nick Fear's adaptation of Mary Shelley's "Frankenstein" begins a three-weekend run at Springfield Contemporary Theatre Center Stage. Celebrate the 200th Anniversary of Mary Shelley's classic novel with the Springfield-area premiere of Nick Dear's "very dark, very serious, very intense" stage version of "Frankenstein", presented by Springfield Contemporary Theatre at SCT Center Stage, corner of Pershing Street and Robberson Avenue in the west end of the Wilhoit Plaza building. Equity actor Nathan Shelton directs the production and plays Victor Frankenstein, with Heath Hillhouse as The Creature. This production includes a cast of 12, which Nathan Shelton acknowledges is "a large group for our space." But they aren't all onstage at the same time because "it's such a sweeping play--it moves through time and through space throughout Europe." Asked what he feels is different about Nick Dear's adapttion of the classic story, Nathan Shelton emphasizes Dear's faithfulness to the original Mary Shelley novel. "It really sets it apart from everything else--he goes back to the book. It's the same thing with 'Dracula' or those kind of Gothic/Romantic horror novels. People want to infuse all this stuff in them that's not there, or streamline the story. And they ruin the characterizations, they ruin what the books are really about. And in this story, (Nick Dear) goes right to the vein, right to the heart of the human experience and the moral lessons that Mary Shelley's novel brings out." We all tend, thanks to the classic 1930s/40s Universal Studios films with Boris Karloff et al., to think of the Frankenstein's monster story as just that--a Gothic horror-movie monster story. But as Shelton--and SCT's publicity for the production--emphasize, Mary Shelley dealt with much larger issues. Making it even more compelling, says Shelton, is that "it's all told from the creatures point of view." He notes that co-star Heath Hillhouse, who plays The Creature, is onstage nearly the entire evening. Says Hillhouse, "It basically starts with the Creature being born: you see his birth, and you follow him along as he goes through life, and grows and learns" just as a human would do, but in a highly compressed compressed way, "almost like being pushed through all the stages of development very, very quickly." Nathan Shelton adds that, while he loves Halloween as much as anybody, "One thing that you don't get here, and which I'm really happy about, is (that) it's not a cheesy, campy 'Halloween' show--that 'AARGH--fire bad, friend good!' kind of thing. This doesn't have any of that. It's a very human story, and the connections in it are very real and palpable. It's a highly theatrical production in its staging. We have it underscored (musically), like a film by a local musician. And oh, my gosh, the music makes everything--it is so powerful. And it's relentless. That's how I describe the script: it moves so quickly through The Creature's story." The Victor Frankenstein character is only seen during about half the show. "But when he comes in, and it becomes these two men locked in this kind of vengeance tale, then it really starts cooking." Central to this version of the story is that Frankenstein abandons the Creature. "It really has a lot to say about what our responsibilities are to each other as humans, what our responsibilities are as creators." As the SCT publicity blurb says, both Mary Shelley's original novel Nick Dear's adaptation touch on questions of "of scientific responsibility, parental neglect, cognitive development and the nature of good and evil." And, says Heath Hillhouse, don't get him started on the fact that the Creature's name is NOT "Frankenstein!" Nor does he necessarily have bolts sticking out of his neck a la Boris Karloff. "You have to ask yourself, really, who becomes the monster? Who really is the monster?" adds Nathan Shelton. "These two men push each other to the limits, and make each other what they become. But it all starts with Dr. Frankenstein leaving, not living up to his responsibility and abandoning this creature that could have been good, could have been bad, could have been anything, but because of what life throws at him, he becomes this murderous, revenge-filled being. But we see them both as very three-dimensional characters--there's not that two-dimensional kind of aspect to this." You can also forget about the "friend... good, fire... bad!" beast-like monosyllabic mutterings (much less the late Peter Boyle's heel-to-toe "tapdancing" in Mel Brooks's spoof of the genre, "Young Frankenstein"!). The Creature is actually very eloquent, even highly educated--"full of complex thought and emotion," says Nathan Shelton. Heath Hillhouse confirms that "That's directly from the book. When he first appears he's this very eloquent, very educated sort of being--Frankenstein is taken aback by how he's able to speak and think and process." As much as we all love the classic movie versions, Nathan Shelton assures us "this is so much more powerful. And getting into the process has been so emotional for the two of us (himself and Heath Hillhouse) and the rest of the cast and crew, who have been working tirelessly to get this very technically difficult production off the ground. And it's cathartic, too, in many ways. The role of Victor Frankenstein is very personal for me. It's been a cathartic process working through my own inner demons. We're so excited for audiences to experience this." Adds Hillhouse, "And strangely enough, the role of The Creature is very personal for me!" The Nick Dear "Frankenstein" was first produced in 2011 at the National Theatre in London, and according to Nathan Shelton, Springfield Contemporary Theatre is "one of the first companies in America to get the rights to do this. (Audiences) are going to see a Frankenstein that's very different than they've ever seen on stage before. It's very visceral." Performances are Oct.19-Nov.4; Thursdays through Saturdays at 7:30pm and Sundays at 2:00pm. Receptions follow the two opening performances Friday and Saturday Oct.19 and 20; and there will be post-curtain Talkback Discussions Thursday the 25th and Sunday the 28th. Remember Thursday nights at Center Stage are "Pay What You Can." Otherwise tickets range from $10-$27 and are available at www.springfieldcontemporarytheatre.org or by calling 831-8001.